See why your company should look into microservices, beyond the hype- how its scalability and other features benefit business and development teams. Microservices architecture style is no longer hype by now. Once you have a plausible pipeline to package and deliver your Microservices (CD/CI) with any automation suite you want or have today, you should be able to obtain the best advantages of this approach since the beginning, since the first Microservices you deliver in Production. Automation is key if you are planning to expand the number of Microservices in your solution in the future, a normal way to do once you start to break down your current monolith. It will support the evolution that is inherited with the adoption of this architectural style. It’s key because you need to assure the delivery quality level in the final product. With proper automation and control, you can achieve the desired result in a faster way. With the concept of dedicated and powered teams that are responsible for all aspects and codebase of a business context (and thus a microservice), after some time, you should see a natural positive performance in delivering new features and business value for a particular Microservice. Microservices can have dedicated teams for two different microservices that need to communicate with each other. The team’s mindset around that specific business context (Boundary Context / Domain Driven Design concept) should evolve naturally due to daily business challenges and demands that occur. It’s normal that their expertise grows more and more each time. Giving the needed freedom of choice to the team so it can define the best way to deliver the business service required. The team will embrace the changes and deliver it accordingly. Once you have specific and smaller teams to evolve and admin the Microservices and the segmented codebase per Microservice, the minimum changes you place in the code will not put the whole solution down because of cross-reference in compile time or runtime. You will not have to rebuild the whole solution because you edited a single dependency that is really used in another module. This is past. Testing should be easier as well (up to some point) once you have the specific business scope to test and vaildate. 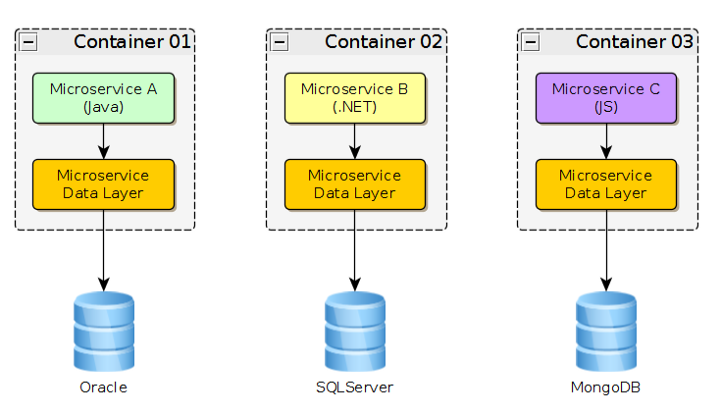 Microservices run in separated execution units, called containers. Containers deliver all resources needed by services. For each Microservice, you should have a dedicated container that supports it. That’s why the automation, in this case, is so important (not only to package and testing) but as well to deliver the final product, with all resources that are needed by the service, delivered in the format of a container with the Microservice embedded in it. Once you deliver the container, you can scale it in an independent way, each container with its only level of scalability, according to the needs of the solution as a whole. One question that arises at this point is: how can we guarantee for sure when to scale a Microservice. How can we monitor any Microservices so we can scale it appropriately? The answer to this question remains in the scope of some Design Patterns for Microservices that will be covered in future posts in this channel. Right now you should realize that is natural within the Microservices architecture to address this kind of problem, in a seamlessly way. Each Microservice can be written in a different programming language, just because they run separately and communicate effectively via well-defined interfaces over well-known protocols. The most common programming languages/frameworks used today are Java, .NET, Go (Golang), Java Script/Node.JS and Python. This gives flexibility to the solution once you can explore the best approaches and features of each programming language. They are made with only one object in mind. Simplicity. As Einstein said: "Everything should be made as simple as possible, but no simpler." Of course, this simplicity comes with a price, but you should vouch for microservices architecture and design your solutions in it with all the benefits it brings to you. Do the trade-off by yourself and you will see the advantages of it. Microservices should address a specific business domain and deliver great business value through its well-defined and public and API documentation. In essence, these are the main drivers that we believe you should consider when you start thinking about a new solution design using the microservices architecture (MSA) style.